1R. M. Morais (e-mail: rmorais@av.it.pt), C. Pavan, and A. N. Pinto are with the Department of Electronics, Telecommunications and Informatics, University of Aveiro and Instituto de Telecomunicações, Campus Universitário de Santiago, 3810-193, Aveiro, Portugal. 2C. Requejo is with the Department of Mathematics, University of Aveiro and Center for Research and Development in Mathematics and Applications, Campus Universitário de Santiago, 3810-193, Aveiro, Portugal. We develop a genetic algorithm for the topological design of survivable optical transport networks with minimum capital expenditure. Using the developed genetic algorithm we can obtain near-optimal topologies in a short time. The quality of the obtained solutions is assessed using an integer linear programming model. Two initial population generators, two selection methods, two crossover operators, and two population sizes are analyzed. 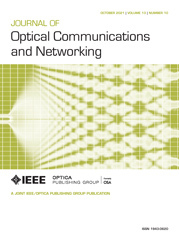 Computational results obtained using real telecommunications networks show that by using an initial population that resembles real optical transport networks a good convergence is achieved.